DualDraw Downdraft Tables for Combustible Dust Collection are designed to capture hazardous combustible dust, including aluminum dust, in a cost-effective, easy-to-maintain manner. For the industrial dust extractor product line, we start with the look and feel of the BG Series with its signature vented back stop and downdraft design. Using design guidelines as outlined in the NFPA Combustible Dust standards such as NFPA 484, 654, and 664, our downdraft solutions are then configured specifically to help customers address the hazardous and often costly process of containing airborne combustible dust. How to most cost-effectively and safely contain combustible dust is an often-debated topic. Regulations vary widely depending on where in the world your facility may have its physical address. Enforcement agencies often provide conflicting guidance on the best approach to control this hazard. Regardless of the confusion surrounding its regulation, the fact remains that airborne combustible dust is extremely dangerous when left unaddressed and that many lives have been lost from explosions directly related to its presence. What is the DualDraw approach? Our non-spark design and compact filter area, on each industrial dust extractor, significantly mitigate the hazard associated with combustible dust. Additionally, our careful selection of the proper filter type based on the details of a customer’s particular application is critical. Finally, we consult closely with our customers to ensure there is a solid understanding of what is involved in owning an aluminum dust collection system designed to capture combustible dust. For example, customers must have a clear hazard communication program and establish rigorous housekeeping routines to ensure industrial dust extractor or aluminum dust collector is kept in optimal condition with no possibility of fugitive dust build-up. Our industrial dust extraction design, combined with specific operational protocols, is how many DualDraw customers are currently safely addressing their combustible dust hazards. 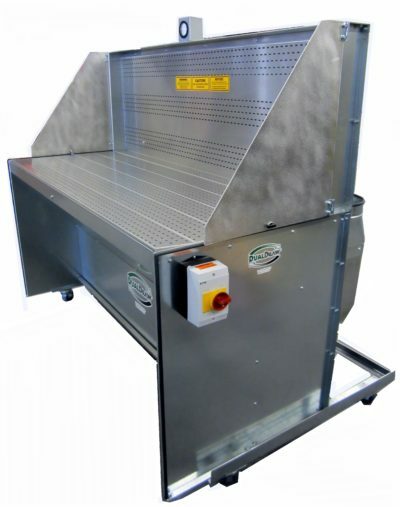 See below for some of our more popular models of downdraft tables for sale and some details about available accessories and options. Standard depth of the industrial dust remover is 30”. Can be increased in 5” increments, please specify. Non-spark build includes work surface, side wings, and vented back stop. Fan wheels are AMCA Spark Class B design. Non-spark work surface consists of C-Channel grates, reinforced for strength. Average table capacity is 500 to 750 lbs, can be increased if required. Standard components include pressure gauge to monitor filter cleanliness, NEMA 12/4X thermally protected manual motor starter, and easy access clean-out tray. Standard electrical options for the aluminum dust collector are 115/230V single phase or 230/460V three phase. Fan, motor, and filtration sub-systems are located under the work surface inside the body of the industrial dust extractor (internal space saver) or attached to back of the unit (as shown above) as a separate sub-system. If attached to the back, unit complies with ADA requirements for sitting operators and adds approximately 20” to the depth to the unit. Standard filter configurations include pleated prefilters and pleated final filters. HEPA filter option available. No self-cleaning cartridge style available for this model given the related combustibility concerns. Standard options and accessories include but are not limited to the following: hazardous duty Class II, Division I motor, heavy-duty caster wheels, soft top non-marring work surface, light kit, variable frequency drive (VFD), heavy-duty work surface, custom powder coat epoxy paint finish.